Today's So Shoe Me is the Lana in Red Tartan by Black Milk Clothing x Solestruck, $190, available exclusively at Solestruck. 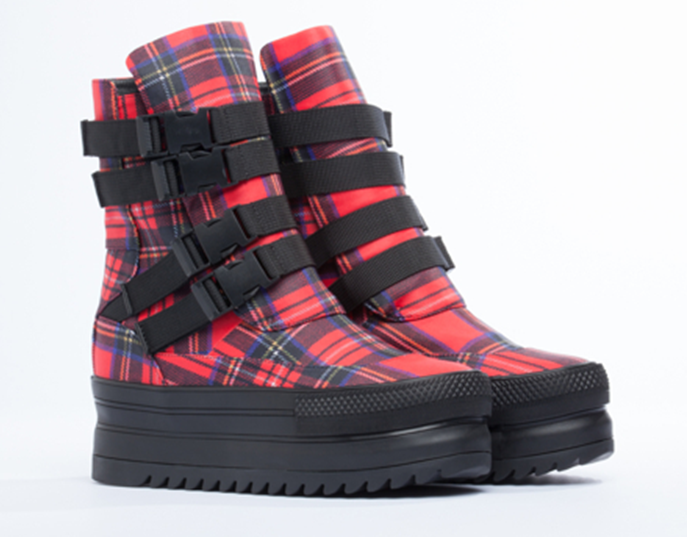 Tartan toughens up in these buckled flatform boots by Black Milk x Solestuck. The authority on nylon and everything bodycon, Black Milk, is delivering sole soothing staples in their most sought after prints in their latest collaboration with Solestruck. The nylon upper offers bright vibrant colors and an easy to clean design so you can wear these in freezing winter conditions or muddy festival dance sessions. Pair these plaid platform boots with a simple black dress and a tough leather moto jacket for a grunge inspired look this spring. So Shoe Me a pair of strapped up tartan boots that will add a stomp-ready style into my festival ready wardrobe.